Children of all generations were aided in their endeavors to learn the alphabet through wonderful picture books. They often included drawings of letters which included animals, birds and words which started with those letters. They are often charming drawings that could be used for a variety of applications from drop cap letters to monograms and initials. These vintage illustrations from days gone by would also make a unique project for your children or make an interesting addition to a scrapbook page for schoolchildren. However you choose to use these alphabet book images, just know that they are…absolutely free, beautifully illustrated, copyright free and downloadable. 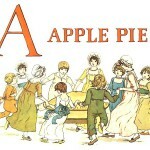 Charming use of the ACBs to create a story about an apple pie. The entire group is by the illustrator Kate Greenaway.